*This post is sponsored by Canadian Lentils. I have received compensation, but as always all opinions are my own. 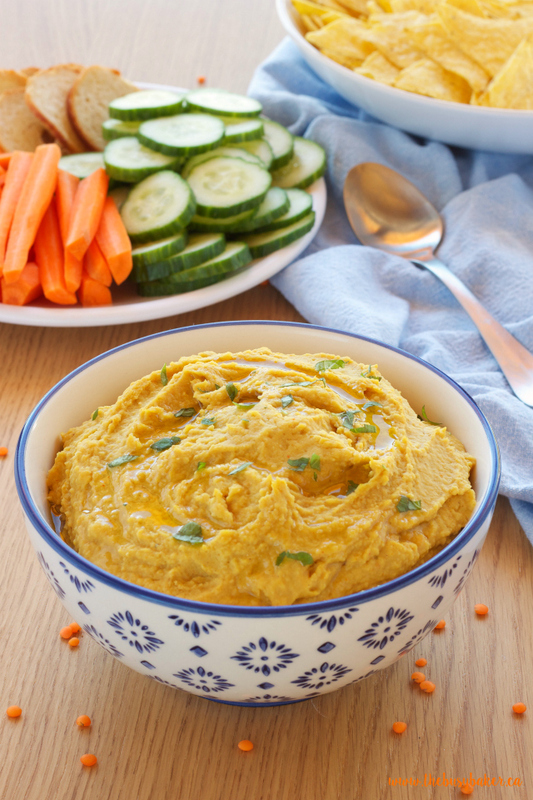 This Red Lentil Curry Hummus is a super tasty and healthy snack featuring red lentils, chickpeas, and a delicious curry flavour. It’s a great dip anytime of the year, but it’s also perfect for enjoying during the holidays as an appetizer with fresh veggies or toasted baguette slices! 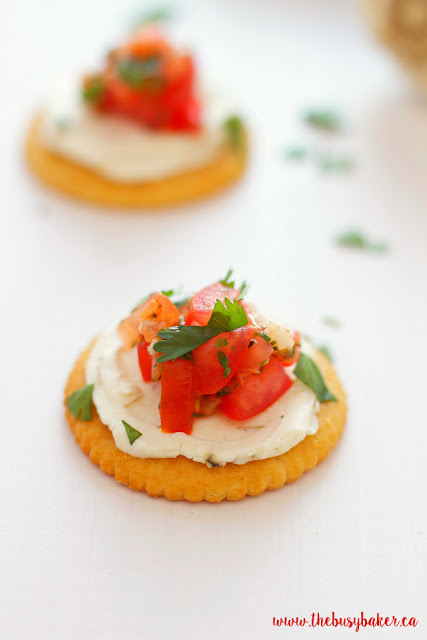 Looking for more appetizers for your next holiday party? You’ll love this list of my favourite appetizer recipes! Hi friends! 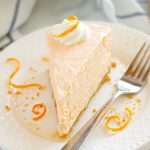 I know I’ve been sharing lots of delicious desserts and indulgent holiday recipes with you lately, given that it is the holiday season and all, which is a bit of a departure from all the healthier recipes I usually post throughout the year. If you’ve been around here for any length of time you know I enjoy the occasional indulgent dessert, usually on special occasions. And if the holiday season isn’t a special occasion I don’t know what is!! But even though the holiday season is full of sweet, decadent treats and delicious hors d’oeuvres, it’s important to include healthy snacks and dishes in our holiday feasts as well. 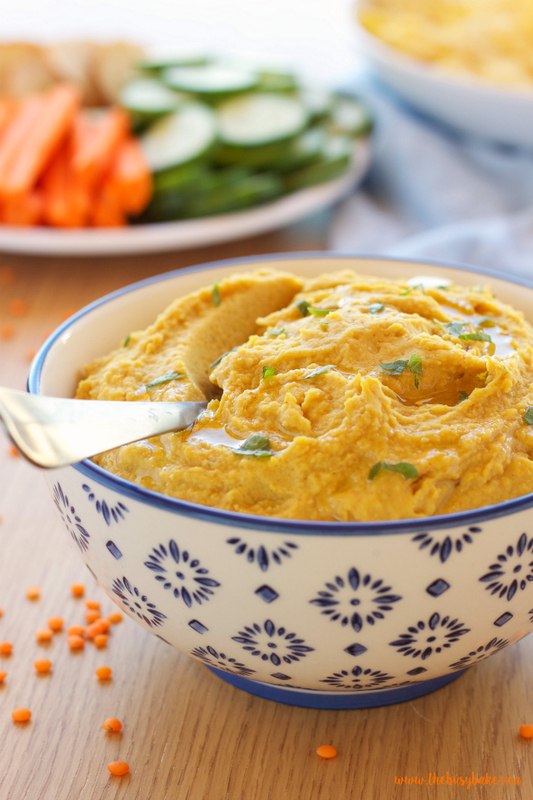 This Red Lentil Curry Hummus is one of my favourite snacks throughout the year, but it’s particularly perfect during the holidays because of its vibrant flavour and colour. It’s a great way to serve your holiday party guests some fresh veggies and it’s completely vegan, so it’s a great option for anyone following a special diet or anyone with food allergies. 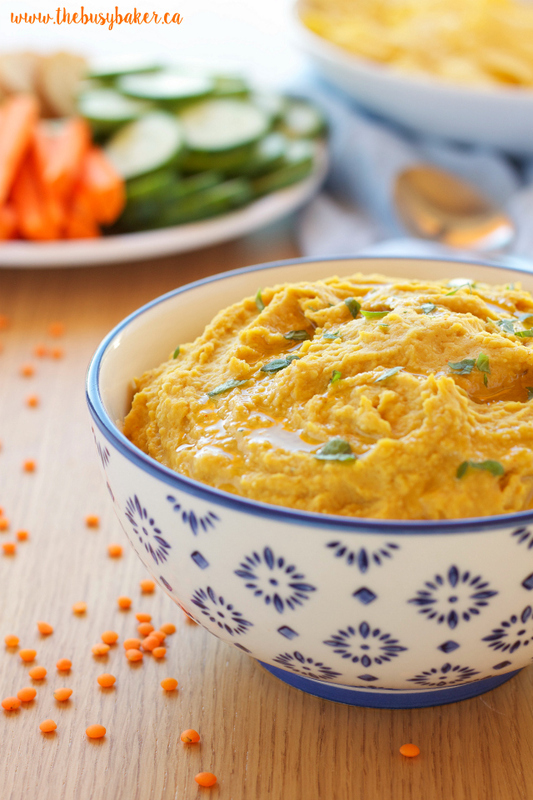 When Canadian Lentils reached out to me and asked me to share 2 of my favourite holiday-inspired lentils recipes, I knew this Red Lentil Curry Hummus just had to be one of them! 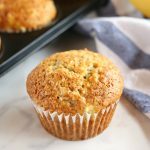 I’ve shared several of my favourite lentil recipes with you before, like this delicious Red Lentil Carrot Cake Granola or these Slow Cooker White Bean and Lentil Chili-Stuffed Sweet Potatoes, and I’m so excited to be sharing with you even more delicious lentil-inspired recipes with you this holiday season. 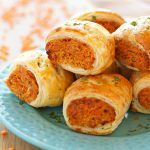 I shared my Vegetarian Red Lentil Sausage Rolls with you last week, so you should definitely check those out if you haven’t already!! I love cooking and baking with lentils, not only because of how healthy they are (they’re absolutely PACKED with protein and fibre), but also because they’re so versatile and go with almost any other flavours. 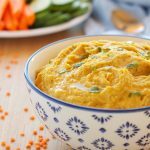 I love using them whole in soups, stews, pasta sauces, and salads, but pureeing them in dip recipes like this Red Lentil Curry Hummus is one of my favourite ways to cook with lentils because their texture is superb. And the fact that they cook in about 5 minutes doesn’t hurt either! I just rinse them, simmer for 5-6 minutes, drain, and then add them to just about anything! 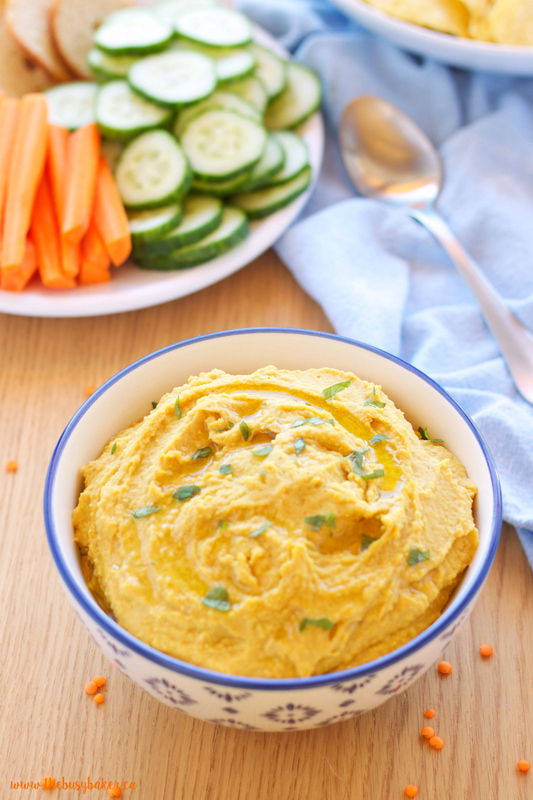 If you love easy, healthy recipes you’re going to love this Red Lentil Curry Hummus! I hope you enjoy this delicious recipe!! Let me know in the comments below, what’s your favourite flavour of hummus? 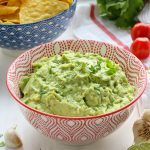 Looking for more delicious appetizers and dips? Check out a few of my favourites below! 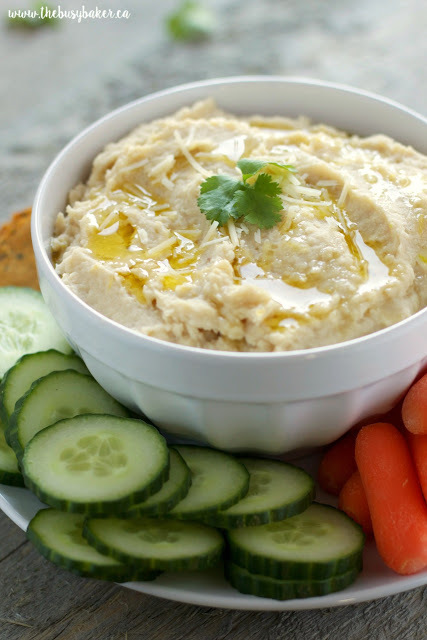 This Garlic Parmesan White Bean Hummus is a family favourite in our house for parties and entertaining, but also for school lunches! 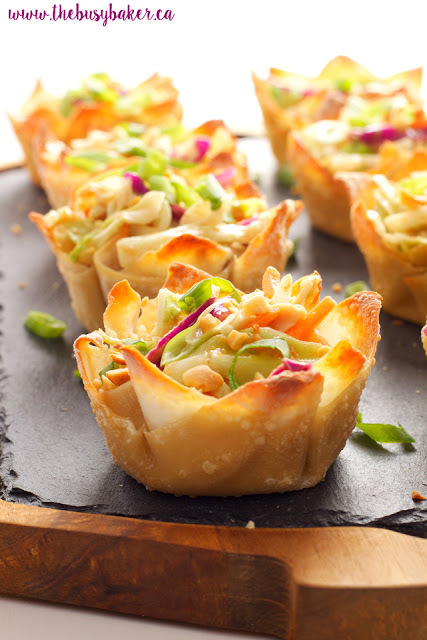 Try these Thai Peanut Salad Cups for an absolutely delicious appetizer or light lunch! 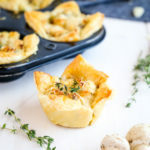 These Creamy Bruschetta Bites are a nice light snack with a delicious fresh flavour! 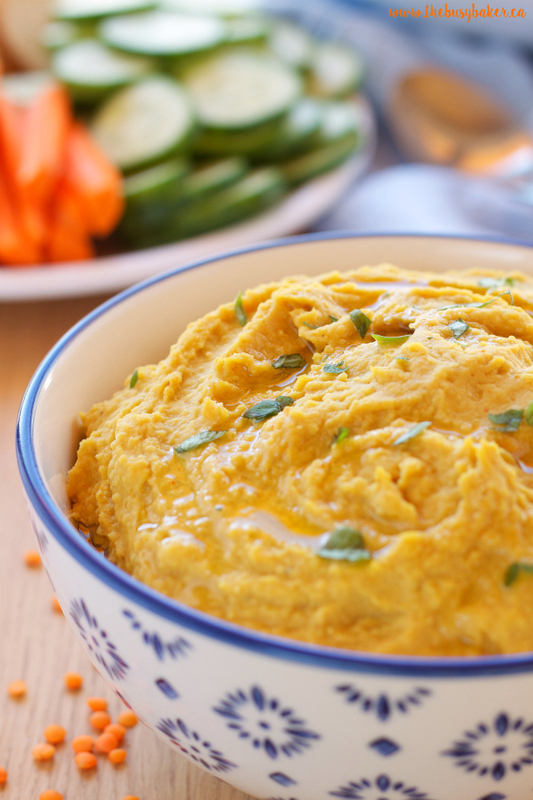 This Red Lentil Curry Hummus is a delicious vegetarian dip packed with protein and fiber! Makes a great appetizer! 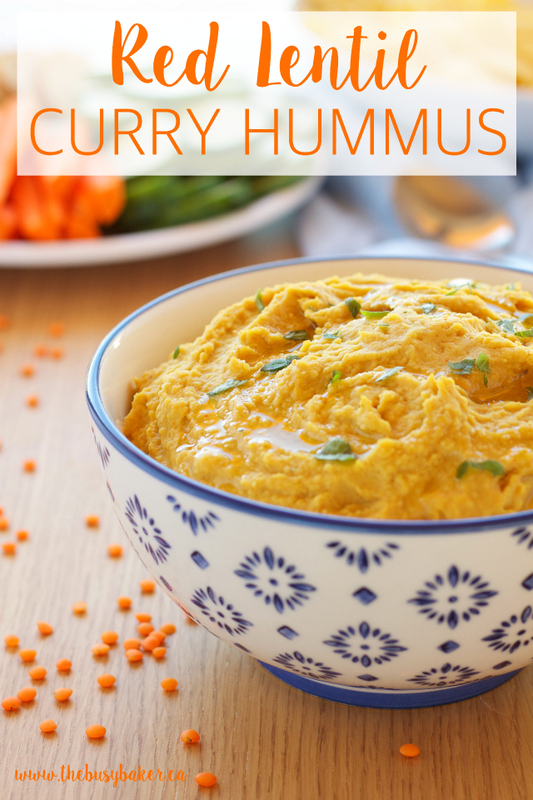 Add the chickpeas, red lentils, curry paste, tahini, garlic, curry powder, lemon juice and olive oil to a food processor or high powered blender. Add about 2 pinches of salt and a pinch of pepper and blend on high speed until the mixture is completely blended and smooth. You may need to scrape down the sides a few times to ensure everything is combined. 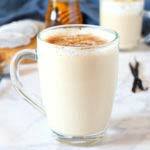 The mixture may still seem a little bit mealy at this point, so add a tiny bit of water one teaspoon at a time while the blender or food processor is running (if possible) until you achieve the perfect loose, smooth texture (about 2-4 minutes of blending should do the trick!). Do a taste test and blend in a little more salt and/or pepper if you desire. Serve in your favourite bowl with a drizzle of olive oil on top and sprinkle it with some finely chopped fresh parsley. Add to a platter of fresh veggies, slices of naan bread, crackers, bagel chips, tortilla chips, or whatever you fancy for dipping, and serve! This hummus will keep in the fridge for about 2-3 days but it's best enjoyed the day it's made. 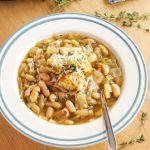 I’m not an expert on dishes for people with diabetes, but feel free to search ‘vegetarian’ in my website’s search bar and you’ll be able to find lots of delicious vegetarian recipes!